Check out this classic 58' Posillipo yacht available for sale in Florida! : Atlantic Yacht & Ship, Inc.
Word just came in from Brad Nelson that he has listed a great deal on a used 58′ Posillipo yacht for sale in Florida! All in all this yacht is a true Italian classic and is sure to please! In the first place, this Posillipo yacht is known as “Ti Loup Du Lac.” Furthermore, this used 58′ Posillipo yacht has been laid out to be a beautiful example of classic Italian motor yacht styling. In fact, the present owner purchased the yacht in 2001 and has continuously cared for and upgraded the vessel. Equally important, the engines had a major overhaul at that time. Correspondingly this made sure they were “turn key” and ready to go! As can bee seen, this 58′ Posillipo yacht also received two new 21 KW Phasor generators. Moreover a new bow thruster, new batteries, updated navigational electronics were installed. Furthermore a new combo washer / dryer, a new teak table on the aft deck, new galley appliances, and counters! Additionally the deck house has just been painted from the rub rail up. Also she got new batteries and charging system in June 2016. This caring and knowledgeable owner has added countless upgrades and if you are in the market for a yacht such as this one then this really is a “must see”! 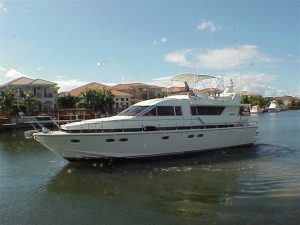 For more information on this used 58′ Posillipo yacht for sale in Florida be sure to contact Brad Nelson today!